Zebrawood lumber has heartwood that is light brown or cream color with dark blackish brown streaks vaguely resembling a zebra’s stripes. 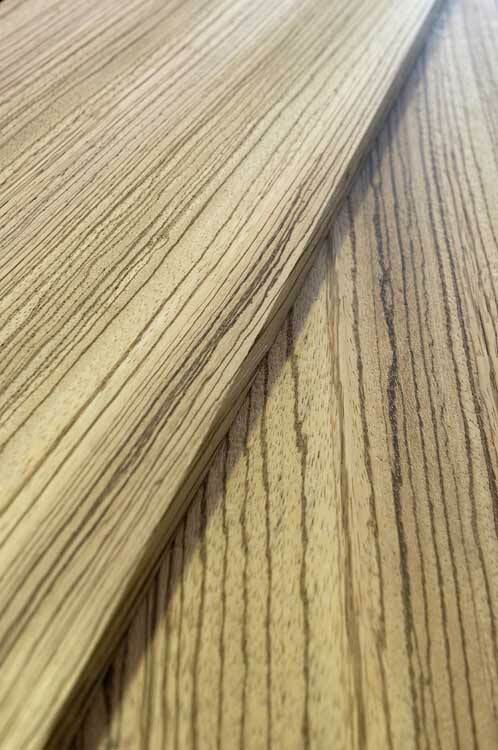 Depending on whether the wood is flatsawn or quartersawn, the stripes can be either chaotic and wavy (flatsawn), or somewhat uniform (quartersawn). The principal use of Zebrawood is tool handles, furniture, boatbuilding, and skis. We also offer precut sizes in dimensional lumber and hobby material like pen blanks and knife scales. Available in 8 foot up to 16 foot in widths from 4 inches to 12 inches and wider. Zebrawood saws well, but can be very difficult to plane or surface due to the prevalence of interlocking grain. Tearout is common. Zebrawood glues and finishes well, though a transparent pore filler may be necessary for the large open pores which occur on both dark and light surfaces.